REAL Trends set out to explore the efficacy of lead generation from live chat services on real estate brokerage websites. For those unfamiliar with chat services, there are a variety of forms from which to choose ranging from internal employee-staffed (broker staffed) to an agent staffed, to third-party staffed. Chat is delivered in a multitude of ways with several variations on the triggers. The simplest form of chat engagement occurs when a consumer sees a chat window immediately upon arriving on the real estate broker’s website. More complex forms of chat engagement trigger by browsing habits, duration on the website analytics, or, in some instances, specific chat dialogs and strategies based on the exact page the consumer is on. Employing a chat service is an easy way to increase website conversions. If you are currently struggling with capturing leads from your website’s contact form, frustrated with the ability to measure your lead conversions, or want to increase engagement and flow of leads, then chat services are especially effective. In this study, we take an in-depth look at how real estate brokerages are effectively leveraging chat services to increase both the number of and the conversion rates for their online leads. In this study, we will explore some of the most common practices when it comes to using chat on a real estate brokerage website. Based on REAL Trends’ research, third party staffing is deemed to be a more efficient type of chat service due to the array of available hours and the speed of responsiveness. We took a sample of brokerages leveraging third-party chat services in the real estate space and asked a series of questions about those chat services. The goal of the study is to explore the impact a third-party chat service has on a residential real estate website’s online leads. In the following pages, we include an evaluation of basic statistics and habits, plus a deeper look at what chat practices generate the most, and best, leads. The best leads are those that end up with a closing. Due to the overwhelming popularity of one particular third-party chat system specific to real estate websites, all brokerages that chose to participate in our online study were found to use the same chat software. ReadyChat is considered a leader in chat services for real estate, and was the unanimous service provider for all participating brokerages. Have you used a live chat service on a website? (real estate or non-real estate related) How would you rate your chat experience on a scale of 1-10? (10 being best) How important is live chat as a part of your web strategy on a scale of 1 to 5? (5 being the most important) Are you aware of how many website visitors you get to your site monthly? Please enter your estimated number of monthly website visitors. Estimate the number of monthly leads you received from your company website prior to installing a chat service. Estimate the number of monthly leads you receive from your company website since installing a chat service. How do you trigger the chat service on your company website? Please select any that apply. How would you rate the quality of your chat leads on a scale of 1-10? (10 being best) Have you seen an increase in the conversion rates from your chat leads versus your contact form leads? What is the conversion rate for your chat leads? For every 10 chat leads you get, how many take further action with you? (i.e. setup showings) For every 10 leads you get from chat services, how many complete a transaction? How easy or difficult was it for your company to set up your chat service? Have you had any complaints from clients about your live chat? Have you had complaints from clients about the knowledge level of the chat employee? All participants in the study acknowledged using a live chat service. Since we targeted our study to brokers who implement chat strategies in their business, it is not surprising that all of them previously used a chat service. We asked this first question to discern whether or not the broker was actively engaged in using chat services, in general. We asked the broker how they would rate their website chat experience on a scale of 1-10, with 10 being the best. Our goal was to find out whether or not the brokerages offering live chat services had successfully used chat services outside of their website. The overall experience with live chat software is highly positive. Some 100 percent of the participants ranked their chat experiences at 8 or better, and 15 percent of brokers gave their chat experiences a perfect 10 rating. Live chat is one of several methods when it comes to capturing online leads. We asked brokerages to rate the importance of live chat services within their entire online strategy. Of the participating brokerages, 60 percent consider live chat a very important part of their overall online strategy. The remaining 40 percent considered it important to their overall web strategy. None of the respondents considered live chat to be unimportant to their online strategy. It is important that brokerages are using live chat and that they feel that it is integral to their businesses; however, we want to know, does it work? Below, we look at the volume in website traffic in general, and trends in website traffic before and after the implementation of a live chat service. 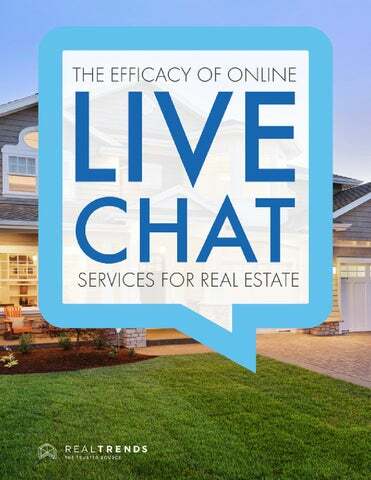 All of the data thus far proves the benefits of live chat for real estate brokerage websites. If you are considering live chat, or you want to see how your brokerage can get a bigger boost in lead volume, read on. Almost as important as the chat service you choose is how you choose to trigger the chat service on your company website. As previously mentioned, there are a multitude of ways to trigger live chat on a website. Common ways to trigger the chat are upon launch, duration on site, and by browsing habits. Our respondents gravitated towards triggering chat after the consumer was on their website for a specific amount of time. 71% triggered after a set period on the website. 14% triggered immediately upon visitor arrival. 14% triggered using a combination of factors, including visitor exit strategies. What is the best way to trigger live chat for a real estate brokerage? To find an answer to this question, we look for a correlation between trigger strategies and lead volume. The clear leader in producing the highest volume of leads from live chat happens when chat is triggered immediately upon the consumer visiting the website. However, the quality of leads is significantly reduced when they are captured immediately upon a consumer landing on the website. Additionally, complaints tend to rise slightly (from non-existent to rarely) for leads generated from an upon-launch chat trigger. Based on the statistics, the increase in volume of leads is not worth the decrease in the quality of leads and the rate at which they convert. The wild card in the triggering conversation is the use of a single trigger or multi-trigger strategy. When analyzing same-sized brokerages that used a single-trigger strategy (i.e. duration) versus those that used a multi-trigger strategy (i.e. duration and browsing habits), both types of triggering strategies yielded the same results. Brokerages with multiple triggers saw an increase in lead volume by 6 percent over those using single triggers; however, there was no notable difference between both groups in the quality of the leads. Approximately one general lead is generated for every 176 visitors that enter a real estate brokerage site. Approximately one chat lead is generated for every 730 visits to a brokerageâ&#x20AC;&#x2122;s website. At an average of $8 per lead, the total monthly cost for brokerages receiving 87.5 leads strictly from chat services is $700 per month. Based on the average conversion and closing rates indicated by the brokerages in our study, live chat services produced an average of 6.6 transactions per month. Dividing the monthly cost of chat services by the number of transactions, yields a cost of less than $100 per transaction. The average gross commission income based on national figures calculated by REAL Trends is 2.5 percent x $210,000 or $5,250 GCI per transaction. Applying the average number of transactions per month, a brokerage would potentially bring in $34,650 GCI as a result of its $700 per month investment in live chat services. This is a huge return on investment from one lead source. It is important to recognize that although our live chat study produced a lot of good data supporting using live chat services, there are some gray areas and nuances to consider. 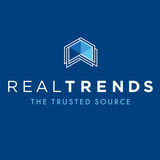 In a section of the 2014/2015 REAL Trends Online Performance Study, REAL Trends studied over 100,000 leads from real estate brokerage websites. The accompanying chart indicates the most common lead sources of 104,365 leads and the percentage of those leads that were assigned to an agent after being vetted by an internal team. Live chat leads generated a smaller number of leads, in general, totaling nearly 5,000 leads from ReadyChat, specifically. However, of these leads 49.18 percent passed through the chat system and were assigned to agents. This was one of the highest performing sources for online leads. ReadyChat leads surpassed the brokerageâ&#x20AC;&#x2122;s website contact form, prominent listing portals, and most other lead sources in agent assignment. This is an example of why the conversation on lead generation would benefit brokerages more by looking at the quality of the lead source, instead of focusing on the quantity provided by the lead source. If you are ready to plunge into the world of live chat services but are nervous that it will be complex or time-consuming, have no fear. In our study, we asked the participating brokerages how easy or difficult it was for them to set up their chat service. Installing a chat service is fairly simple and quick. A brokerage will probably spend more time setting their trigger parameters than it will on the installation. Besides picking basic colors and a welcome greeting, you simply place a small piece of code on your website (similar to a Google Analytics code), and your live chat service is ready to roll. responses, regardless of time and volume of incoming leads. The overwhelming sentiment by brokerages was that clients and customers where not bothered by nor did they complain about the chat service. We did see a small acknowledgement in the study that there were minimal complaints about the knowledge level of the person initiating the live chat. Nearly 60 percent of the brokerages reported that they never had a complaint about the knowledge level of chat staff. Roughly 30 percent of surveyed brokerages said that they very rarely received complaints, and 10 percent of brokerages said that they occasionally receive complaints about the knowledge level of the live chat staff. The data from the study indicates that a multi-trigger strategy using a duration trigger (a certain number of browsed pages or time on site), in conjunction with a browser activity trigger (specific to how the consumer is engaging with the site) is the best way to capture quality leads. Although we did not study the specific duration of time on the site or number of pages viewed in this study, our guideline is to take the average time spent on your website and use that as the duration trigger. The same logic applies for page-view triggers. Pairing the above strategy with a browser-activity trigger is a solid cross strategy. The most common browser-activity trigger is when the consumer proceeds to exit the page and his or her cursor crosses over an imaginary boundary at the top of the page, or on the navigation bar. This movement away from the page triggers a chat dialog to start. This is often referred to as an exit strategy. In addition to a multi-trigger strategy, REAL Trends also advises having content specific triggers. For instance, on a neighborhood page, you can trigger the chat window to operate differently with a different prompt. This type of strategy is more engaging for the consumer. If they see a message related to their actual browsing behavior, they are apt to respond to the chat request. Chat services prove to be one of the easiest ways to increase website conversions. Third-party chat services bring clear, measurable benefits to real estate brokerages. On average, third-party live chat services provide the following: 36% increase in lead generation 49% rate of agent assignment of a qualified lead 7.5% rate of lead conversion into a transaction If you are not already using live chat services, we recommend you give it a try. Track your results and see if your website lead capture rate increases. Additionally, measure your lead conversions and compare the conversion rate of your live chat leads versus your other lead sources. Based on the research in our study, most brokerages saw positive results within 45 days or less.